The Sioux Nation Relief Fund (SNRF) Programs were created to serve the thousands of Sioux Indian people suffering from hunger, isolation, and poverty. In the area we serve, unemployment is staggering 86 percent compared to the national average of 5.5 percent. Over 60 percent of the people live below the federal poverty level. Children and the elderly are most fragile. They’re extremely vulnerable to the effects of poverty, routinely suffer from hunger and nutrition-related illnesses, lack access to health care, and live in substandard housing. On the Pine Ridge Sioux Reservation in South Dakota, 59 percent of the homes are considered substandard: 39 percent of homes on the reservation do not have electricity, and 60 percent of families have no telephone. In addition, many residents do not have access to fresh water and must carry water from the local rivers to use in their homes. Overwhelming? To many people these conditions may seem that way. 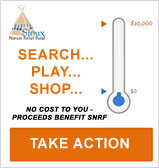 But SNRF is dedicated to giving the Sioux people a sense of partnership and hope. SNRF relies on the generosity of local volunteers to deliver goods and services to their communities. In fact, our Mission is strong, self-sufficient American Indian communities. By utilizing local volunteers, we involve the community in creating positive changes. Provides nutritional meals and food to the most vulnerable Sioux Indian people. Ensuring that Elders without electricity can cook as well as stay warm in the winter. Provides the help necessary to sustain the Native American life after enduring a natural disaster. Providing Thanksgiving meals for those Sioux Indian people living in poverty and isolation.